Cherry Dutch Baby Pancake with Pecan Streusel is the simplest pancake you can make — pour an easy batter into a cast iron skillet with sweet cherries — no flipping! 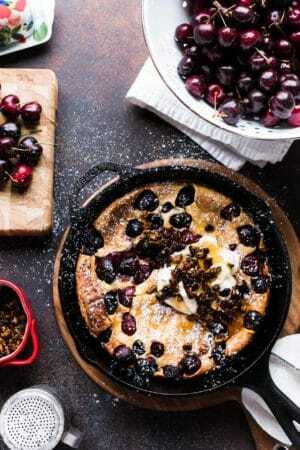 Keep breakfast sweet and simple with Cherry Dutch Baby Pancake with Pecan Streusel! Serve with whipped cream, syrup, and a homemade pecan streusel…or make it dessert with a scoop of ice cream! Sunday morning rolled around and to be honest with you, I just didn’t feel like flipping pancakes. Not that it’s difficult or strenuous, but sometimes, you just need a vacation, even from a stack of pancakes. Plus there were the cherries. 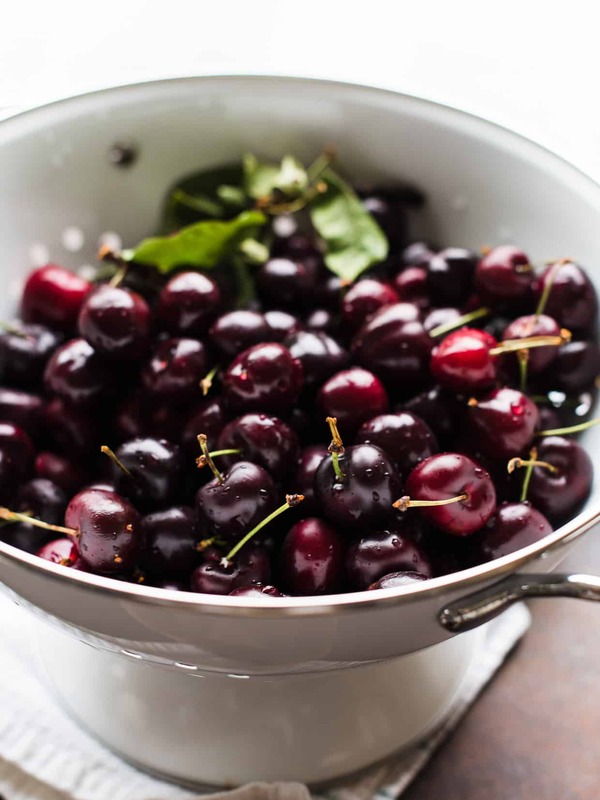 I’m actually sitting here with a big bowl of sweet cherries, leftover from the 5-plus pounds we picked on Mother’s Day weekend. Pop the cherry in your mouth, munch, spit the pit into a little bowl, repeat. And repeat again. 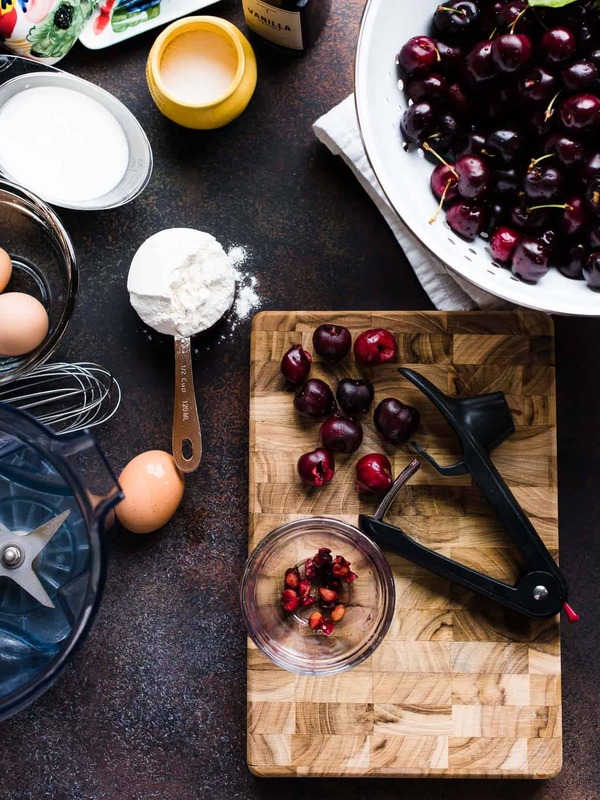 But I put the cherry pitter to good use on Sunday to drop the cherries into the cast iron skillet sizzling with clarified butter before pouring the pancake batter in the center, spreading out towards the edges, enveloping the fruit along the way. Out from the oven, it emerged, but the house felt a bit like a zoo yesterday that I turned my back, got interrupted, and missed capturing its lofty glory for you. I’m sorry. I’ll do better next time. But it couldn’t wait, and maybe that’s the point. You have to be ready once a dutch baby pancake is ready because if you’re too late, it will deflate. And any longer than that, it will disappear, just like that. 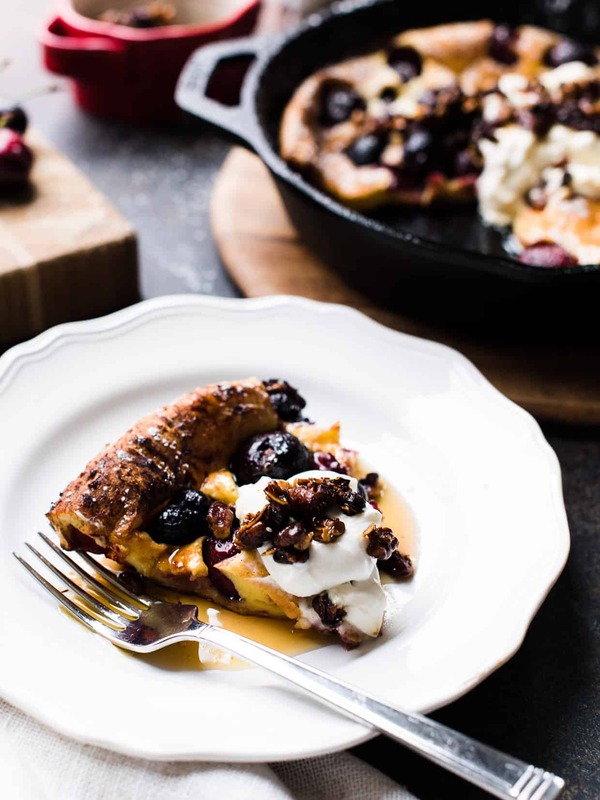 Keep breakfast sweet and simple with Cherry Dutch Baby Pancake with Pecan Streusel! Serve with whipped cream, syrup, and a homemade pecan streusel...or make it dessert with a scoop of ice cream! Preheat the oven to 425°F with a rack in the center of the oven. Combine the eggs, milk, flour, vanilla, and salt in a bowl. Whisk until the batter is smooth. This can also be done in a blender. Heat a cast-iron skillet or very heavy pan over medium-high heat. Add the butter and cherries and cook for about a minute. Pour the batter into the center of the pan and transfer to the oven. Baker for about 20-25 minutes, or until the pancake is puffed. While the pancake is baking, make the streusel. Melt the butter in a pan over medium heat. Stir in the pecans, oats, and flour, and mix to coat. Cook for about 5-10 minutes, or until golden and toasted. Set aside. This can also be made in advance. Slice the pancake and top with whipped cream, maple syrup. Sprinkle with the pecan streusel. If you prefer to swap the whipped cream with yogurt, this also tastes great. And of course, ice cream transforms this into a decadent dessert, too. Cherry time! Yummy! Lovely recipe!